Wood Burning Stove Installation -Do you Need to install a wood burner ? At TFS we specialise in supplying, installing and servicing wood burning stoves and fireplaces to domestic customers. We have worked in all kinds of properties including listed buildings and new builds and we’re used to working in sensitive conservation areas. We also work closely with architects, planning officers, interior designers, property developers and country estate managers. We offer the complete service from choosing the stove, carrying out any associated building work, installing the stove and flue and making ‘good’ including any remedial plastering. We have been installing fireplaces and wood-burners for years and we have extensive experience in all aspects of flue and chimney work including flue system design, chimney re-builds and linking up wood-burning stoves to central heating systems. 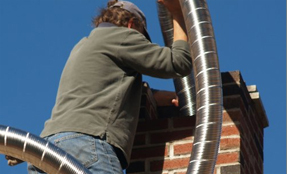 There’s not a flue or chimney problem that we haven’t come across before! We use only the very best stainless steel chimney linings that carry a 15 year guarantee and don’t worry if you don’t have an existing flue, its usually possible to build flues either up through the house or up the outside of a house. We can rebuild chimneys that are threatening to fall down and re-instate capped off chimneys that haven’t been used for a while. It is possible to install wood stoves in thatched properties but they need to be installed using a special method that has been developed by the Guild Of Master Thatchers and the Fire Service. Owners of thatched properties with wood stoves are advised to have the chimney swept 3 or 4 times a year to prevent the build up of tar and creosote. If you live in a thatched property, please contact us for more information.